Below we show you some examples of how we can add lustre to your event. 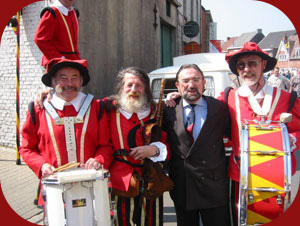 A cortège. Do you celebrate carnaval, or do you organise a medieval event? 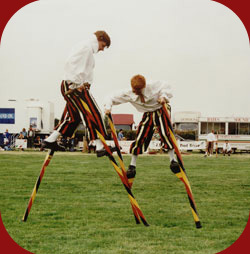 Our stiltwalkers are adding extra spectacle! 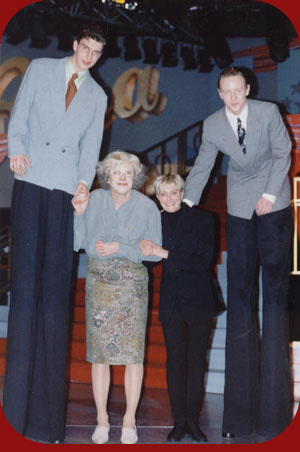 Stiltfights. 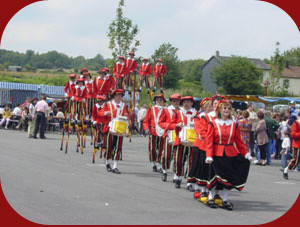 All Stiltwalkers engage into the fight and try to push the adversary from the stilts. Although this is always performed with maximum prudence, following such a battle is a sight to see. 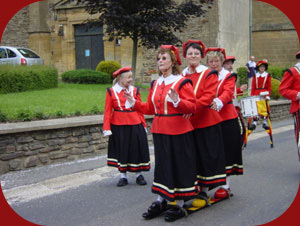 Our Clog-Walkers. The ladies walk in clogs attached to skis and walk in the same rithm. This is an additional visual aspect in our show. TV Shows. Do you want to cheer up the TV show? A clown. Do you organise a happening or party with lots of kids? 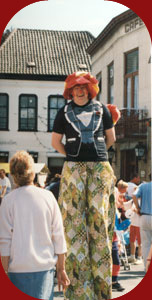 A clown is a must then, but what about a stiltwalker clown? The kids will certainly look up to him! Weddings. You are getting married and you want a very special, a unique wedding picture. Only few people have a wedding picture standing under a stiltwalker! Show Business. Singers, actors can make more show by inviting us to their event. Publicity. You are looking for media attention to support your campaign. 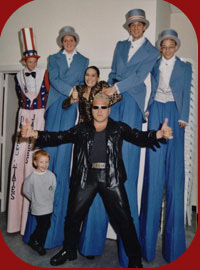 What attracts more than some of our stiltwalkers around you? Go to "contact us" immediatly to hire us!